Well made and looks just as shown in the photo. 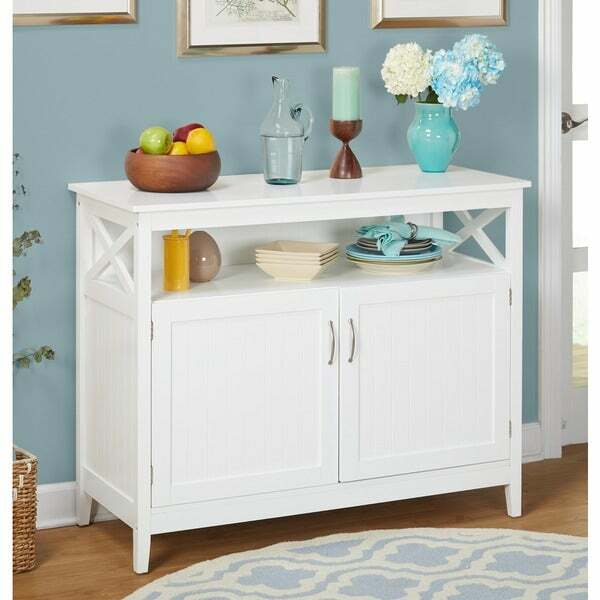 Entertain your guest for a pre-dinner snack or simply display your favorite knickknacks with this versatile MDF buffet. This piece can easily fit with any decor thanks to its simple, homey design and clean white color. This contemporary buffet features side panels, a two-door storage cabinet and an adjustable shelf, offering plenty of storage room and an adaptable structure to best suit your needs and taste. I am giving this an excellent rating based on it's low cost, perfect condition on arrival and how well the parts were labelled. The instructions for assembly were well thought out too. The finished product is very impressive looking and belies its low cost. I would caution care in assembling (two people as recommended) because the legs did show signs of stress when being put together. I do not expect this to interfere with its use, however, but could have been avoided if you remember it is not solid wood. There were even extra pieces to secure the back when done. I expect we will have this piece for a long time and will be perfect for entertaining in our enclosed outdoor back room. Was looking for a pantry as well as a place for my microwave and cookbooks. This buffet is perfect! It took my neighbor about 2 hours to put it together. He said that everything was labeled and that the directions were good. The only reason I rated it a 4 and not a 5 is because one of the doors sits lowere than the other so the handles are about 1/4 inch off. I can live with it though. Other than that I love it! This is quite a great piece of furniture for the money! It is a bright while color so it tied in well with my white and glass topped table and chair set. There is ample storage space inside the unit too. It is a sturdy piece and can easily go anywhere extra storage space is required without being an eyesore. Quite a lovely design as well! My husband actually wants one to put together and use under his big screen TV. He likes that it is not low like many of the TV stands out there and he can store his equipment inside the cabinet unseen so it does not look cluttered. I used it as a buffet and placed my large crystal salad bowl and some wine glasses on the exposed shelf and it looks very elegant as part of my dining set. Could not be happier! 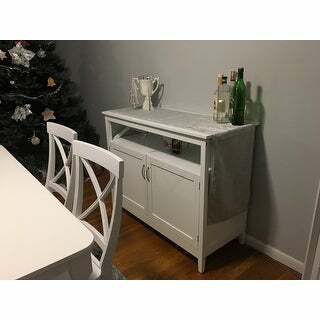 i love it fits perfectly where i needed it andyes it does take two people to put together but beautiful when done plenty of extra storage also. I am so satisfied with how this buffet looks. It is made very well and the color is a bright white. Exactly what I was looking for. They do take some time putting together and the instructions could have been just a little better but no issues figuring out how to put it together. Just keep an eye on how the pieces face which is something not in the instructions. You really have to look at the pictures which mostly show how they are facing. I am very pleased with the size and know they are going to hold a lot of items. The shelf inside is very adjustable so that is also a plus! No problems with shipping since they were packaged very well. Not one was damaged. They gave extra hardware also which we didn't need but it was nice knowing we had extra if needed. All in all I am very satisfied with all four we got. Good value for money. Nice style and color, plenty of storage space (internal shelf adjustable, making it great for all those awkward sized kitchen appliances). Assembly requires a little patience and the occasional help from a second person, but it wasn't difficult. I didn't give this 5 stars because the corner of the top shelf was dented slightly, the external hole on one of the front legs was cut off-center, leaving a straight, sharp edge. This means the screw is slightly visible from the front (we found it strange that those external screws didn't come with some sort of white cover to hide their presence). But the most annoying thing is the doors are a bit crooked, even though the holes for the hinges seem to be even. We attempted many times to straighten them to no avail. It doesn't seem to bother my husband, but it annoys me!. This piece of furniture is attractive and has a large amount of storage space. My husband said that it was very easy to put together. I love the amount of storage behind the door and the little shelf to display nice dishes. The color is a brilliant white and helps to lighten up any space. Nice and clean buffet lots of storage. Lots of uses for this cabinet! I love this cabinet! It's really nice quality and easy to assemble. I'm using it in my kitchen for extra storage for pots, pans and cutting boards. Large pots would also fit nicely in this cabinet. Very pleased with all the different uses for this cabinet. I wanted a buffet to go with our new dining room set, also from overstock ... it was pretty easy to put together. We had a little bit of trouble putting the final shelf in, but it is really sturdy and looks great... I’m so happy we bought ! Got a great deal on this cabinet. Took awhile to put together, take your time, instructions are not the best. Once assembled it's a very nice addition to my kitchen. Adds some much needed space. Overall I'm very happy with the buffet. It's taller than I thought it would be which I'm happy with. My only complaint would be that the top scratches easily, thus the reason for 4 stars and not 5. Had multiple scratches on the first day. Otherwise, it looks great in the space and I love having the extra storage! Love it! Easy to put together and looks great! Easy to put together! Sturdy!! And looks fabulous!!! The back is brown pressed board so looks terrible from the window. Have had it several months and both doors have come apart where the manufacturer attached them. So disappointed. It seems cheaper than I’d like; mostly particle board, but looks nice from afar. Gets the job done. The style of this is nice but generally cheap material and only lasted us &lt; 2 years. The top nicks up very easily and the doors never fully matched up. Took my wife and I two hours to assemble but well worth it. A great addition to our kitchen with a lot of storage. Good bargain. This item is well worth the money!! Well packed, easy to understand assembly instructions. Excellent finish on the surfaces. I definitely recommend this buffet! Perfect for my coastal style in FL. I had to have someone put it together, however. Unless you are a handy person, it would be very hard to assemble. Versatile buffet. Very pleased with my purchase! Delivered in short time. Very well packaged. All parts well labeled. Easy to put together, but do need 2 people. Looks great and durable! My kitchen looks nice with it, I am very happy with it! "How much does the buffet weigh assembled?" This is approximately 85 pounds. "Is the width 45" or 54". Both widths are indicated in the faq. Please clarify." This measures approximately 36 inches high x 45 inches wide x 20 inches deep. "What is the width please? Specs give a range, which I don't understand. Hoping it is close to forty inches wide v fifty four. Thx." "What is the measurements please"
"Are the dowels thatsholds the shelf metal or wood?" The dowel is made of wood. "Do think the surface could be easily repainted? I'd like to match some other accessories in the room. Thanks." I think it could be painted easily. Sorry just seeing this question and I think it could with a lot of sanding and work. I am moving to a 3rd floor condo with an elevator. Is this buffet delivered to the door or at curbside? "Is the white an off-white or a true white? Thanks!" According to customer reviews the color is a bright white color. I would prefer off white or antique. My daughter has this piece and it is not bright white.